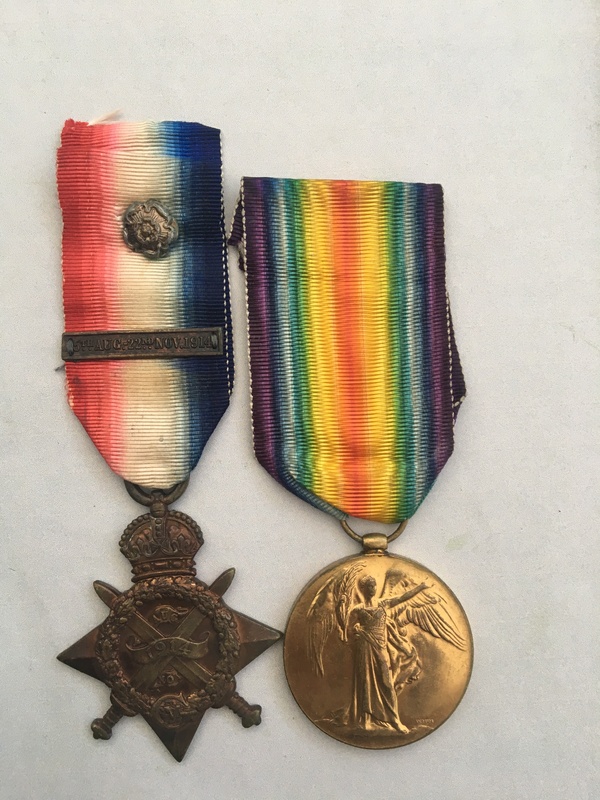 A WW1 Mons Star with bar medal group awarded to 6541 Rifleman Frank Beaumont, who served with the 2nd Battalion King’s Royal Rifle Corps. He died of wounds ‘received in action’ on the 23rd October 1914, his Commonwealth War Graves Commission entry can be viewed by clicking on here, he has no known grave and is commemorated on the Ypres (Menin Gate) Memorial. 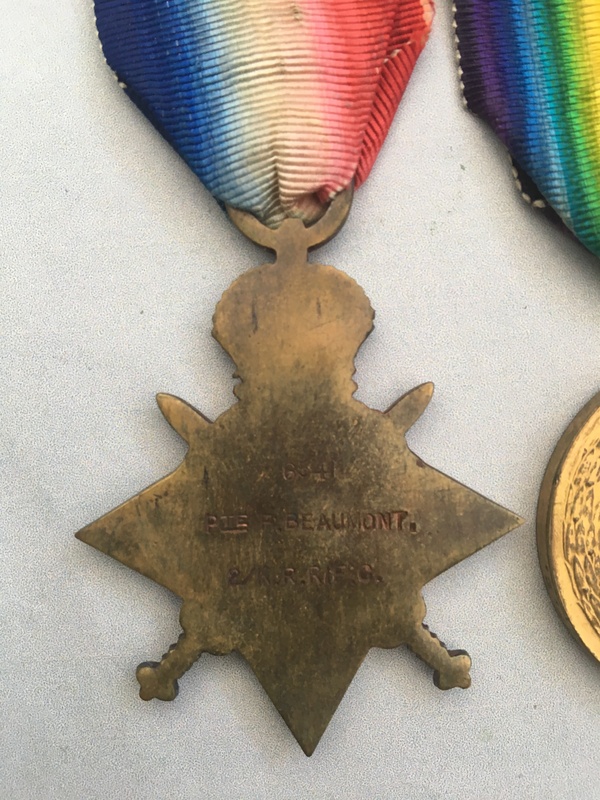 1914 Star (with Mons Clasp) named to 6541, PTE. F. BEAUMONT. 2/K.R. RIF. C.
Victory Medal named to 6541 PTE. F. BEAUMONT. K.R. RIF. 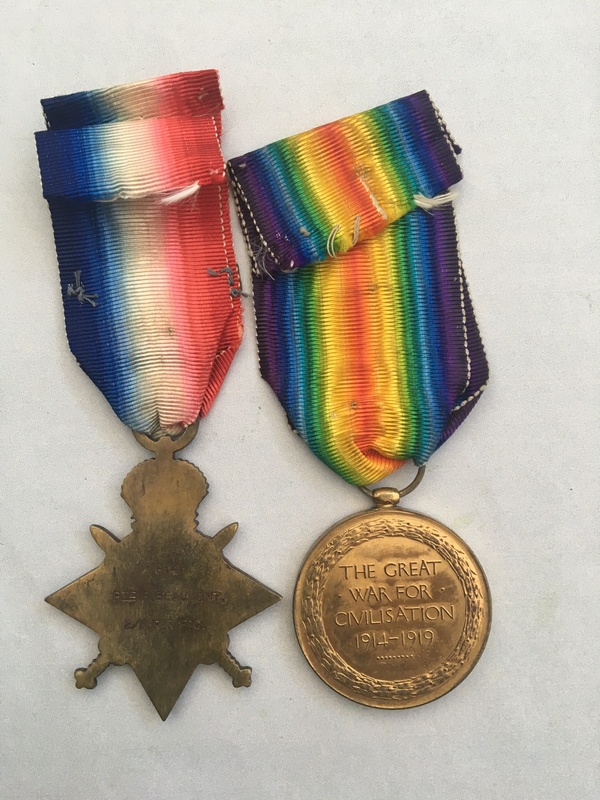 C.
The medals are loose and come with the original ribbons, sadly the group is missing its British War Medal and Memorial Plaque. His Medal Index Card which can be viewed by clicking on here, (if you have access to Ancestry although a paper copy will be provided with this listing) confirms that he was eligible for the clasp to the 1914 Star. His medal roll details can be viewed clicking on here and on here, (again if you have access to Ancestry). Beaumont was a career soldier and according to his service records, (which can be viewed by clicking on here, if you have a subscription to ‘find my past’), he was born in 1884 in Burnley, Lancashire. By 1891, he and his five siblings were living with relatives (and later working as a labourer) in Wakefield - presumably their parents having died. Beaumont enlisted at York with the King’s Royal Rifles in June 1905 aged 21 - signing on for 9 years active service (a number of which were spent in Egypt) and 3 years with the reserve to which he was transferred to in April 1912. It appears his service was satisfactory with only one infraction shown in 1909 when he was ‘confined to barracks’ for being a ‘nuisance’. His service records show that his next of kin was his sister (Esther) at an address at 16 Marsland Street, Primrose Hill, Wakefield and his file contains correspondence between his sister and the regiment in regards to his awards and belongings. Beaumont would have been called up from the reserve at the onset of WW1, and his Medal Index Card shows that he arrived in France in August 1914 as a part of the 6th Brigade serving with the 2nd Division. During 1914, the Division was involved in the following engagements, the Battle of Mons and the subsequent retreat, in addition, it was involved in the Battle of the Marne, the Battle of the Aisne including participation in the actions on the Aisne heights and the First Battle of Ypres. The date of Beaumont’s death falls in the middle of the duration of the First Battle of Ypres, details of which can be viewed by clicking on here, which probably explains why he is commemorated on Ypres (Menin Gate) Memorial. His sister Esther is shown on the 1939 Register, she never married and sadly she died in the workhouse in Wakefield in 1940 - by this time it was more and institution for the elderly rather than an actual workhouse. Price £250 - please read the terms and conditions below.